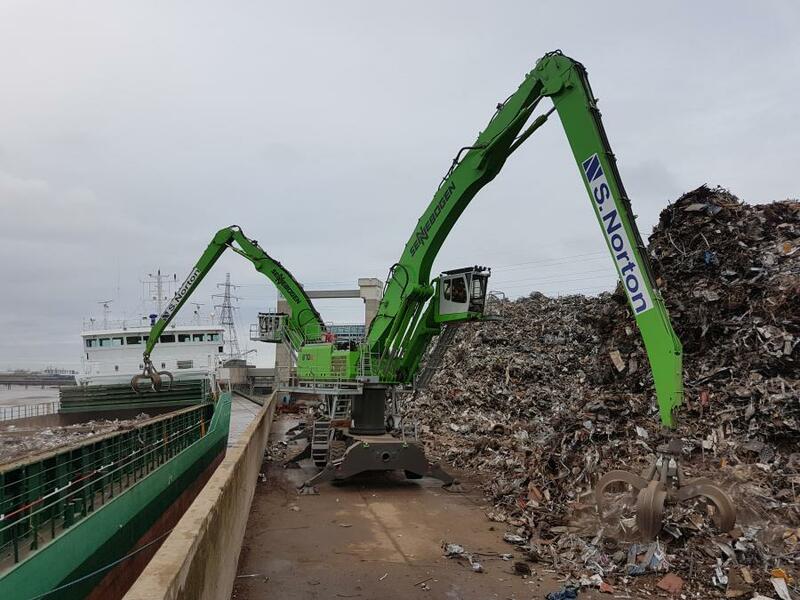 S. Norton & Co’s two new Sennebogen 870 M material handlers are seen loading scrap at the firm’s Barking River Port. Two new 206,30 lb. (93,500 kg), rubber-tired Sennebogen 870 M material handlers are the centerpiece of a $14 million upgrade program at S. Norton & Co's ship-loading facility in Barking, UK. Located on the Thames River, the Barking River Port serves vessels linking Greater London to the English Channel and the North Sea. The 870s are mounted on 6 ft. (1.8 m) pylons and fitted with a boom and stick giving it a 79 ft. (24 m) reach, larger outrigger pads for increased stability, and 3-yard 5-tine grabs. The machines also feature the Green Hybrid energy system, utilizing a large central boom cylinder to hydraulically capture “free” energy when the boom is lowered, then use the stored energy to assist each lift cycle.